Don’t risk your business security to just anyone. Allstrong Locksmiths are Queensland’s leading mobile commercial locksmith. 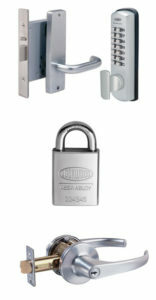 We use only the highest quality locks, hardware and keys, and provide expert security advice at great rates. Best of all, we come to you 24 hours a day, 7 days a week. Whether you are a School, Hospital, University, Council, Airport, Utility Company, Industrial location, Hotel / Motel or commercial offices we have had many years of experience with locations just like yours. We know what we are doing and offer long term durable solutions. We are fully insured with 20 million in Public Liability Insurance. We can provide you JSEA’s or Safe Work Method Statements. We are fully licensed and all our Locksmiths are trade qualified. Being a Commercial Locksmith varies from residential type requirements as it involves a different type of product and a different knowledge base that usually comes with years of experience. Allstrong Locksmiths have developed this knowledge and experience over many years of this type of work. We can help you with Master Key Systems, Card Access Locks, CCTV Security Cameras, Commercial Door Hardware, Panic Devices, Door Closers, Access Control, Swipe Cards and Electronic Locking. The security of your business is important to us. So in an emergency situation we’ll be there fast. We’re known throughout Queensland for our incredible professionalism, quality materials and high-level security expertise. Call Queensland’s favourite commercial locksmith now on 1800 550 750.